Before I get to the roof top visit to Canterbury Cathedral and the Swale Borough Council Heritage and Culture Review meeting, I thought I would flag up three events which the Centre is either running or in which it has an interest. Starting with the former, all being well, which means the builders will have made considerable progress over the next week, Dr Diane Heath and Harriet Kersey will be running the first of three ‘Young Medievalists’ Corner’ activity days on Saturday 7th July at 12 Market Place, Faversham, as part of the ‘Medieval Faversham’ exhibition, and as an addition to the Faversham Society’s Open House scheme. If you are going to be in Faversham on the Saturday, please do go and have a look, and those with children, Diane and Harriet will be delighted to welcome you. See a Carrow ‘beast’ on the western tower. For those in Canterbury on the same day, Professor Louise Wilkinson, Dr Paul Dalton and I, with a band of student helpers will be based in the Greyfriars Garden as part of the Medieval Pageant. Again, there will be child-friendly activities and the troupe of re-enactors will be stationed in the Garden too. Thirdly, and by way of more advance notice, on Saturday 21 July, the ‘Finding Eanswythe’ project team would like to welcome you to an all-day (10.00-16.00) event in Folkestone. Following a successful time in Dover last weekend, the team has invited Øst Centingas of Regia Anglorum, the leading Anglo-Saxon re-enactment society, to the Amphitheatre, Lower Leas Coastal Park, Folkestone. Do come along and enter their Anglo-Saxon summer encampment for a taste of life in 9th-Century Folkestone. You will be able to learn about their weapons, food, lifestyle, beliefs and more. For those of a more war-like disposition, you will get the chance to witness a struggle between Anglo-Saxon and Viking warriors! Great cloister, chapter house and archdeacon’s house from Canterbury Cathedral’s western tower. Now it was an exceptionally long blog report last week, so this week I’m going to keep it short and provide photos of Diane and my trip up the western towers of Canterbury Cathedral in the company of Heather Newton, who heads the conservation team at the Cathedral. 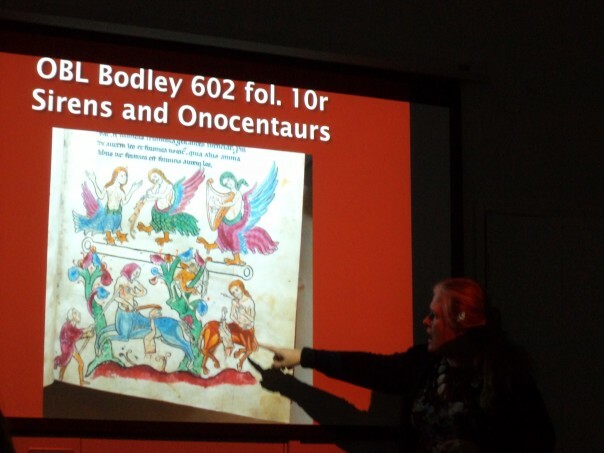 Heather has been in the blog before when she has taken me up Christ Church Gate and the Great South Window – see earlier blogs, so readers will know just how great she is and how much of an expert. In this case, I will just say that she pointed out Carrow’s 19th-century work and talked us through what the masons and others are doing regarding the twin west towers, including a great deal of cleaning and replacing the present mortar with lime mortar to allow the building to breathe. After a quick tour around, your visit restricted by a bomb scare which had brought everyone off and out of the cathedral just before we arrived there and meant we didn’t get on site until 20 minutes after we had hoped, Heather took us into the central nave roof space. 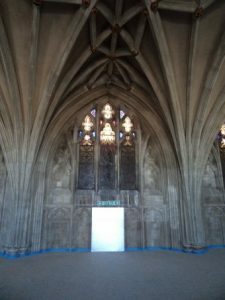 Getting up close to the roof was a great treat and meant that we could really appreciate the delicate fan vaulting, so typical of the late Middle Ages. 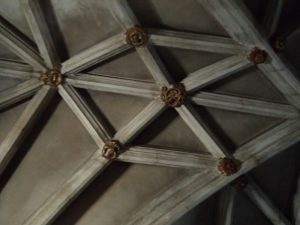 Also there are numerous roof bosses, and though difficult to photograph, they look in remarkable condition. 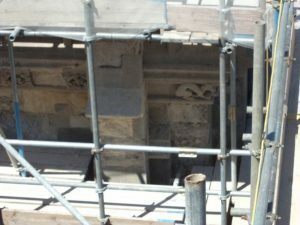 What is especially interesting is the presence of Tudor roses, which indicates that some at least post date the rebuilding of the nave. 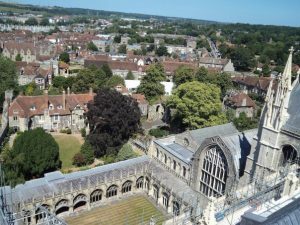 I know Rupert Austin and his building recording team at Canterbury Archaeological Trust are working on this and it will be fascinating to hear how they think these various building phases were undertaken. Moreover, such later bosses compared to the known date of building are similarly present in the aisle roofs, so their development will be equally fascinating. Yesterday I represented the Centre at the Swale Borough meeting where the Council is consulting interested parties about what they think needs to be considered before drafting Swale’s new Local Plan. 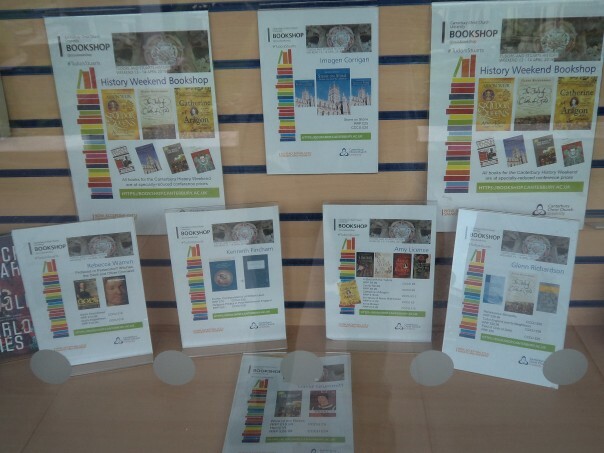 Rather than go through what was discussed, I’ll confine myself to highlighting just how passionate these representatives of local museums, other visitor attractions, and local and regional history societies are about their localities, and its history. There were several people representing various places in Sheppey, including the dockyard at Sheerness, groups from Sittingbourne and Faversham, as well as those having wider interests, either regionally or nationally such as Kent County Council and Historic England. The Swale team was ably led by Alan Best the Principal Planning Officer, who did a good job of keeping the discussion to the agenda items and provided some valuable points about the limitations the Council face in terms of how much they can manoeuvre when confronted by national policies that demand new house builds on an unprecedented scale. At the same time there were considerable discussions about the reliance on volunteers to staff many of there heritage attractions and this was putting great strain on the various organisations. Consequently, many felt more financial support from the Council would be especially valuable. Yet, at almost every stage in the discussion, there was a willingness by all sides to listen and it will be interesting to see how this develops. 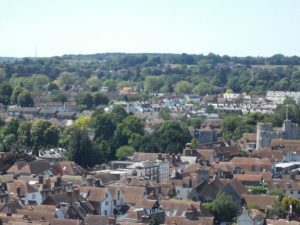 Finally, I just what to pass on the link to Canterbury Christ Church’s latest digital edition of Inspire that includes a Canterbury history feature of short pieces by several Centre historians: https://www.canterbury.ac.uk/inspire – do please check it out.